We install bay windows across Dunfermline, Edinburgh, Stirling, Rosyth, Perth, Dundee, Fife, Glasgow and surrounding areas. At SRJ Windows, we offer an expert service when it comes to supplying and installing bay windows in your home. With an extensive range of styles to choose from, we aim to meet your every need. We offer sustainable materials, skilled craftsmanship and our platinum 10-year guarantee. Stylish bay windows not only enhance the look of your home but can also add some extra space, letting in more light and framing your views of the outside world. Our bay windows offer far more than just good looks, so you can be sure you’re bringing something special to your home. You can choose from a wide range of colours/textures and materials to match the interior and exterior of your home, making them unique to your own personal taste. Whether you choose Anthracite Grey, Rosewood, White or Black, you can rest assured you’re getting the best. 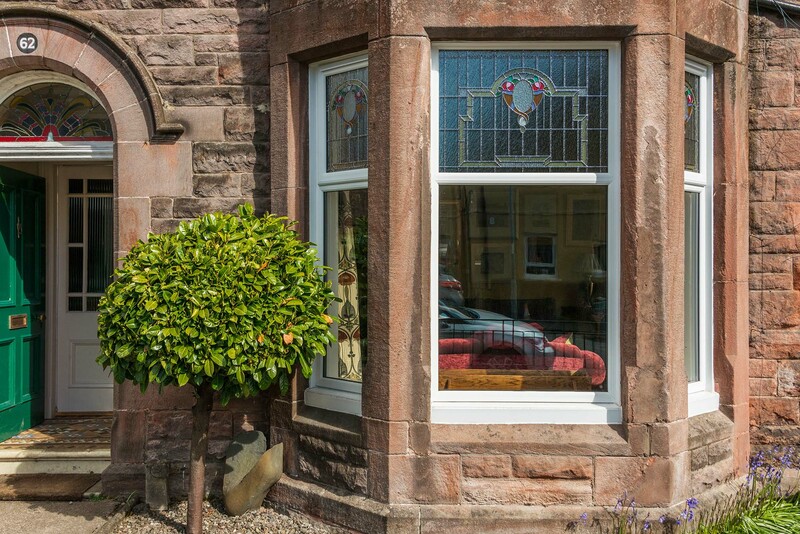 If you’re currently in the market for bay windows in Scotland, you need a trusted, reliable supplier and installer with a great reputation. We’re a privately owned, family-operated business, which means we are committed to providing excellent service to new and existing customers alike. Bay windows are designed to project outwards from your home, and can be designed to include up to seven window panes. Bay windows have many benefits, giving you more floor space, additional light, larger window sills and giving the impression of a larger room. At SRJ Windows, all of our windows are fitted to the highest standards to ensure your home remains secure and stylish. Our flexible approach to window installation means that you can tailor many aspects of the design to suit your needs. We offer bay windows in a variety of colours, including White, Rosewood, Golden Oak, Grey and Black Ebony. Constructed from high quality materials, including hardwood timber surround to finish, our bay windows are built to last. Alongside enhancing the look of your home, our bay windows also help you to feel comfortable throughout the year. They are double glazed for better thermal performance, allowing them to achieve impressive thermal ratings. You’ll be able to keep the winter winds at bay, whilst enjoying a potential reduction in your heating costs across the year as you use your central heating less. For your complete peace of mind, all of our bay windows are accompanied with our 10-year platinum guarantee. This means that you can enjoy the peace of mind that comes with lasting quality. In the unlikely event that you should have any problems with our bay windows, we’ll be on hand to sort things as soon as possible to get things back to where they should be. Nothing says a professional installation like the perfect fit, which is why all of our bay windows are to made to measure based on your specifications. It won’t matter about the size or style of your home, we’ll be able to provide the ideal window design for your home. With this in mind, all of our bay windows will always perform to the standard that they are designed to. Feeling comfortable in your house is one of the main things that makes it feel more like home. All of our bay windows comprise a modern design that helps them to achieve a high level of acoustic insulation. You’ll be able to keep noise pollution on the outside of your home where it belongs, allowing you to enjoy peace of quite throughout. To keep your home safe from any would-be intruders, our bay windows feature a reinforced design that is enhanced by high security, multi-point locking systems. Through this combination, our windows are able to achieve a consistent standard of security across the whole frame, so you won’t have to worry about any potential weak spots that can be used as a potential leverage point to gain access into your property. Manufactured using a recyclable profile, our bay windows can be recycled at end of life to be reused time and time again. This is all done through a careful process to ensure no quality is lost through the process. Further to this, their thermal efficiency properties allow you to reduce the amount of energy escaping your home and, in turn, your carbon footprint. You’ll be able to enjoy better quality in a sustainable way. Our bay windows only require a quick wipe with a damp cloth to ensure they maintain a fresh and clean appearance. Further to this, you won’t have to worry about cutting, repainting, sanding or varnishing these windows as the inherent qualities of uPVC prevents them from bowing, twisting or cracking when exposed to the weather. These windows will work to enhance your home long after initial installation. To get a free and competitive bay window price, you can get in touch with us via our online quoting engine to get a bespoke quote. Alternatively, you can get in touch with us via our online contact form should you have any questions. Alternatively, our showroom is also a fantastic place to visit if you would like to see our bay windows first hand. A member of our team will be more than happy to help. The team at SRJ Windows really appreciate you taking the time to contact us. One of our friendly and knowledgable advisors will be in touch with you as soon as possible to provide our very best quote. In the meantime, you can connect with us though our various Social Media channels, which highlight our glazing experience. Also, have a read of our blog at www.srjwindows.com/about-us/news/ for inspiration on how to improve your house. 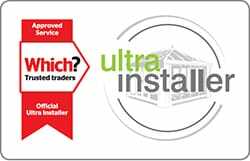 SRJ Windows are pleased to announce to our customers that we now hold the Which? Trusted trader accreditation! Our quoting engine is a modern way for you to get a free, no obligation and competitive quote for your home improvement of choice. All you will need to do is choose the product you're interested in, enter your contact details and we'll be in touch to confirm your quote. If you would like to speak to a member of our professional team in a way that is convenient for you, you can visit our online contact form to do so. We’ll be on hand to answer any questions you may have, and we can offer you a quote through this method if you’d prefer. If you want to see our extensive range of high quality products up close and personal, you can come and visit our showroom in Fife. A member of our friendly team will be more than happy to show you around and help you find the right choice for your home.